Some people try hard to distance poker from other forms of gambling like sports betting; arguing that it doesn't help the luck vs. skill debate that will always go on. Others, however, recognise that we poker players love a bit of a gamble and as long as it is done responsibly there is nothing wrong with that. Our friends at Ladbrokes Poker seem to have hit the nail on the head nicely and managed to combine the two. Their latest promotion, Sports Day Saturday, is essentially a poker tournament like any other, with the added value that it is also a cheeky punt on the football. At 12.30pm on Saturday two identical MTTs will start up, each aligned with a particular football result and poker players sign up to whichever result they agree with. Anyone who finishes in the top five of the winning tournament will receive an additional $100 on top of their winnings. So not only is it a cracking Saturday afternoon poker tournament but it is a free $100 bet too. The bet in question this week is a pair of David vs. Goliath encounters; Man Utd vs. Derby and Chelsea vs. Sunderand. One tournament will be for those of you believe that Man Utd and Chelsea can score 8 or more goals between them, the other tournament for 7 or less goals. So now you can combine a good session of poker with a Saturday afternoon in front of the match, and be a big winner in both for the price of your tournament entry. 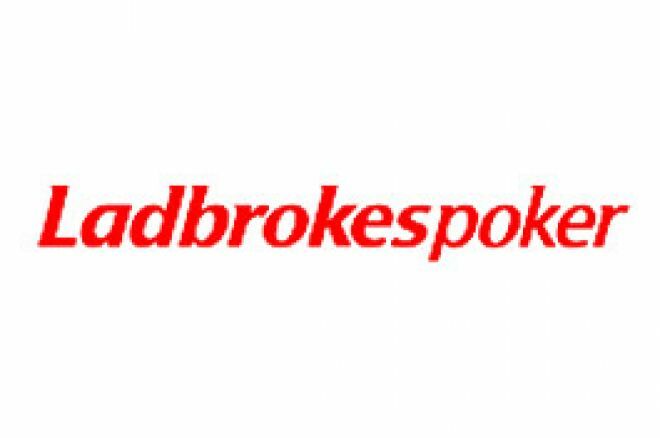 Don't forget as well that you can get a 100% sign up bonus up to $500 with Ladbrokes Poker when you sign up through UK PokerNews. You will also be eligible for 30% cash back for player points and still have a chance to qualify for the Ladbrokes Poker Cruise. Football and Poker are a perfect mix this Saturday, now if only there was a tournament called Ricky Hatton floors Floyd Mayweather in round 8.